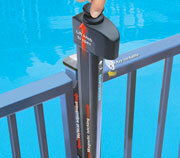 AboveGroundPoolSafety.com offers Premium Guard, the DIY solution to above ground pool fence safety. 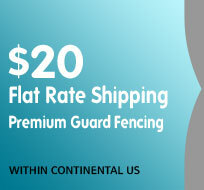 Premium Guard fencing by Sentry Safety Pool Fence works to enhance the level of security for above ground pools. The modular fence is made of rustproof PVC resin which is durable but also lightweight. It can easily be installed by pool owners as a safety centric home project. Premium Guard creates a visually well manicured appearance. 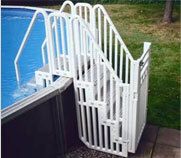 This above ground pool fencing helps to keep toys, inflatable balls and floats within the pool. Meanwhile, it helps reduce unauthorized pool use by children, guests and pets. Our Premium Guard fencing system, which is ordered by the section, can be applied to the majority of standard designed above ground pools. The premiere brand for in ground and above ground pool fencing. Our quality product line and dedication to child safety has made us the most widely sold DIY pool fence brand in the world. There are many above ground pool retailers, but ReadySetSplash.com takes into account one thing others don't - our customer's budget. DIYPatioDeck.com is an unmatched do-it-yourself decking supply shop. AboveGroundPoolSafety.com also offers safety stairs, pool gates, foot baths, pool and deck lights and other above ground pool accessories. Finally, with AboveGroundPoolSafety.com's detailed on site instructions for installation and knowledgeable tech support you'll find how-to assistance easily accessible. Plus, we make ourselves available on the weekend when most customers are doing home projects. We have 9 a.m. - 9 p.m. support hours 7 days a week so you're never on your own when it comes to DIY installation. AboveGroundPoolSafety.com is here to take care of your above ground pool safety needs.